A brief introductory disclaimer: I received no money or any other compensation for writing this post, and I will never promote something on this blog unless I sincerely believe it contains value for my readers. There. Now with that out of the way, let me share with you one of the most entertaining cookbooks I've read in years. Every once in a while a cookbook falls into your life that is such a pleasure to read that you simply have to recommend it to everyone you know. 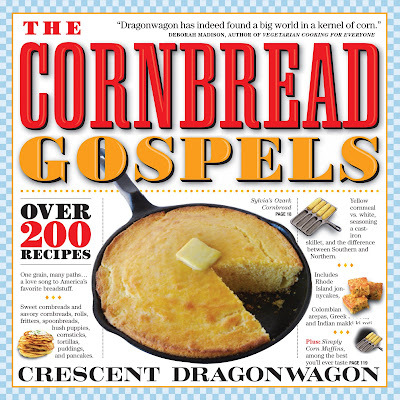 And just such a cookbook fell into my life a few weeks ago: The Cornbread Gospels, written by Crescent Dragonwagon, and published by Workman Publishing. It's hard not to smile and even laugh throughout reading this book, thanks to the author's contagious enthusiasm and the self-evident fact that she had an absolute blast writing it. And with more than 200 recipes, ranging from straight cornbreads, to muffins, to flapjacks pancakes and johnnycakes, to desserts--even an enormous chapter on foods that go with cornbread--this cookbook is going to be a source of many, many recipes for me in the future. "...just talking about cornbread makes people happy." 4) Greek Cornbread (doused in an orange-honey syrup no less, page 105). 6) Old South Style Beans (always served with cornbread, page 303). I hope to feature some of these here at Casual Kitchen in the coming months. It's a rare cookbook author who can write so engagingly, share so many great recipes--and actually teach you something too. Curious to learn how to season a cast-iron skillet, a critical tool for making Southern cornbreads? Want to know about the history of cornmeal as a subsistence food here in the USA? Ever wondered what really is the difference between Southern and Northern-style cornbread? This book explains all of these things and more. "Cornbread takes us to the home we had, or the home we wish we had, or the best parts of the home we did have." I can only think of one criticism of The Cornbread Gospels, and it's simply that the recipes should include expected prep and cook times. I always look for this information to help me decide what recipe I might make based on the time I have available to cook. But that's just a minor criticism of an otherwise exceptional cookbook. Cornbread has always been a favorite of mine, and this book is overflowing with great new (at least to me!) recipes for muffins, johnnycakes, and the like. And the folksy, witty stories scattered throughout make for the best cookbook reading I've had in years. Note: you'll need a 10" cast-iron pan to authentically recreate the recipes she so lovingly details. I'd never owned/used one before- and for me, learning to work with cast-iron cookware was a big part of the fun of using this book.